I think I can relate, I only sing when alone in the car and nobody can be hurt. Shifting gears, I have to know…what is a greasy chip butty?! A greasy chip butty is a sandwich filled with thick cut chips, like French fries but thicker, the greasy bit is because they still have fat on them after coming out of a deep fat fryer. Okay, thanks for the response. I assume the butty is some type of meat..pork? Thanks to having several English friends (including you) I know that a butty is a sandwich…as in jam butty but had never heard of this one. Since I’m a lover of chips it looks right up my alley…but unfortunately they don’t serve them here in the Seattle area. Lots of other greasy food but this one hasn’t made it yet. I can’t really sing either (more lack of training because I have a good ear…thus my ease in learning Italian). I’m reminded of an ad I cut out of a magazine…It was either for cat food or cat litter and had a lovely black and white cat. The caption read “has heard you sing and not laughed once”. i sing my heart out in my kindy class all day long and they are none the wiser. yet. Hi Beth, on a Monday I teach English to four classes, the oldest is nine and the youngest class is six. Despite knowing my singing is appalling, I have been using songs to help the children to learn English. Elaine, you have never had a chip butty? What never! I thing you are missing out. To make them taste wonderful, a little bit of salt and vinegar should be added. When I was at school (days that I try to forget) At lunch time Chris and I would climb through a hole in the school fence and then buy a small uncut loaf of bread. We would ask the baker to cut it in half. As we walked to the chip shop we would eat the soft bread from the centre of our own half of the loaf. 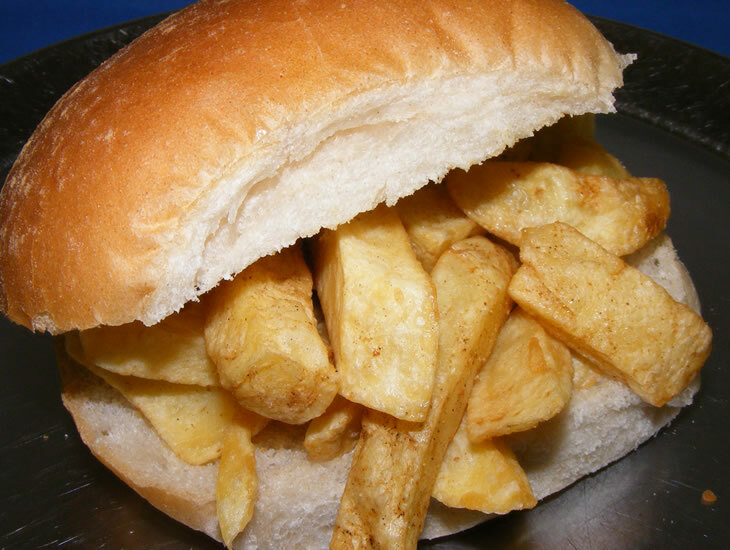 At the chip shop we would each buy a portion of chips, and once outside we would cram them into the hollowed out loaf, give it a squeeze and we both had a giant chip butty. It’s true, A loaf of bread and a big bag of chips was cheaper than 2 schools dinners and tastier. Oh PN you had me in stitches with this one!